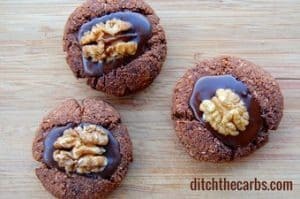 These really are the easiest little best low-carb chocolate cookies to make and are just the right size to help satisfy that sweet craving we sometimes have. 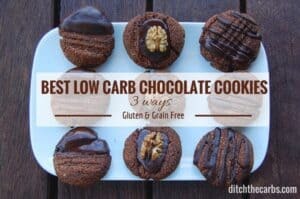 These gluten free chocolate cookies have no added sugar, wheat free, and grain free with only 2.7 net carbs. My children loved them and named them the “best low carb chocolate cookies ever!” so hence the title. I have shown 3 ways to decorate them, but I’m sure you can come up with a dozen more ideas. 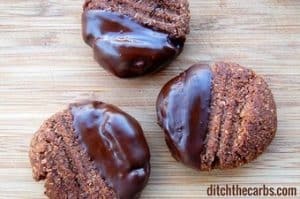 The addition of some 90% dark chocolate really lifts them up and makes them look like a regular biscuit but without the sugar, bad fats and horrendous carbs. And with these little babies, you really can stop at just 1, not watch as the entire batch used to disappear before your eyes. I think that is the real benefit of low carb baking and this way of eating. With carb heavy baking, you lose the stop signal and end up eating more and more. With low carb baking your blood sugars don’t rise, your insulin doesn’t rise and your appetite stays in control. I don’t make sweet treats as often as I used to (that’s part of the ethos of going low carb is to give up sweet tastes) and I really savour each one. These delicious cookies are not only sugar free, but gluten free and grain free. To see all the ingredients and gadgets I use in all my recipes and cooking videos, check out my Low-Carb Keto Shop on Amazon. I use ground almonds or almond meal in my baking as it is cheaper than almond flour. It is not as fine as almond flour but you can use either. If you have a powerful blender, you can actually make your own ground almonds. I use Natvia brand of stevia or Swerve erythritol. They are both granulated and measures spoon for spoon, although I use much less than most other recipes state. I always add a note in my recipes to add stevia (or your own sweetener of choice) to taste. Everyone is on a different part of their journey to give up sugar so what one person might taste as just right, another will taste as far too/not enough sweetness. Desiccated Unsweetened coconut comes as shredded, flaked, thread and fine. Make sure it is the unsweetened variety. For making I use shredded or fine and keep the thread and flaked coconut for my grain free granola. 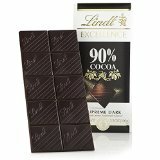 Chocolate, without a doubt my favourite is Lindt 90% Cocoa . If you can’t find this in your local store, use the highest % of cacao you can find. To see exactly what is in my pantry, click here. These are the best low-carb chocolate cookies for beginners. They are easy to make and can be decorated three ways. Hey, why not ask your children to decorate them for you? Mix the softened butter, sweetener and cocoa together until smooth. Roll mixture into 14 small balls, then place on a baking tray lined with baking paper. Press down with a fork. Bake at 180C/350F for 15-20 minutes. Yumm! !I made this recipe the other night and they were delicious!couple things thougj,i added 1 more Tbsp of erythritol and 1 tsp of vanilla extract.I didnt have medium eggs so i used 2 large eggs.Baked for 20 minutes and turned out chewy and yummy!Will mkenit again! How much sweetener to use is so personal, which is why I always say “or more to your taste”. We are all on different parts of our sugar-free journey. I like your additional vanilla, I’m a vanilla fan too. So I have not rad all the comments to see if anyone else noticed this but you have the US conversion wrong. I wonder did you even try these cookies after you make them. I had so much “” batter that I made three different versions of the cookies the first one with one cup of almond flour since 2 Cups seemed Way excessive the second batch with an added half a cup of coconut flour those also turned out horrible so in the last batch I added another tablespoon of butter horrible so tasteless and unsweet, like eating chocolate sand! No wonder you had to decorate afterwards, the added sweetness from the icing would be the only way I can imagine these cookies being tolerable. I even added Lillys chocolate chips to some of them and it didn’t help at all! What a waste of expensive precious ingredients! These were awesome! Especially straight out of the oven! I didn’t decorate them afterwards like in the picture. I just used a home brand cocoa powder as it was the lowest carb one I found and with my brand of ingredients it worked out to only 1.5g net carbs! Thankyou for the recipe…will be making these again for sure! Sorry I can’t see this clearly confirmed reciepe makes 14 cookies but is 1 cookie a serving? Made these tonight and the flavor was good but they were extremely dry. It seemed like 2 C (USA) almond flour was way too much “dry” base for them. The 24 I made also seemed quite large compared to the ones in the pic. Did I miss something? Mine came out very dry too. The dough was very stiff. They are tasty, but maybe I’ll use less almond flour and dessicated coconut. Or maybe we can add an extra egg? Not sure. Same here. I’m thinking an extra egg would be amazing. You could try and use extra ground almonds or another ground nut/seed that you can tolerate. However this would need a bit more “tweaking” of other ingredients to make sure it turns out beautifully. But that would actually be an amazing cookie indeed. I’ve made these quite a few times and they never disappoint. I’ve even substituted coconut flour (50g) and they come out great! They sort of remind me of a “no-bake cookie” with the shredded coconut but mine always come out a little drier than your picture. Various flours come to different conclusions I suppose. Still delicious none the less! Thank you for sharing! I’ve gone though so much almond meal trying to achieve a crisp cookie. Do these turn out crisp? Any suggestions on how to avoid the soft cookie syndrome? Would coconut flour be better for that? These are a soft (ish) cookie than a crisp one. It is difficult to find a true crispy low-carb cookie, because the crunch in cookies comes from they high sugar content! 🙁 My favourite cookie, which my children love, are my chocolate chip low-carb cookies. They are crispier than these, depending on how long you bake them for. These are so the bomb! I added a mixture of 60% cacao chips blended with butter on top and some walnuts or pistachios. Good recipe! I used a Tablespoon (20 mls) of mixture for each biscuit. Made 26. Hi, so is the 6.7g carbs – is that the total for the 14 cookies or per actual cookie? There is no serving size listed. How many cookies is a Serving? Bless you for sharing this recipe I really need a little snack that’s healthy for me and tasty. Thank you. Thanks for another delicious recipe Libby. 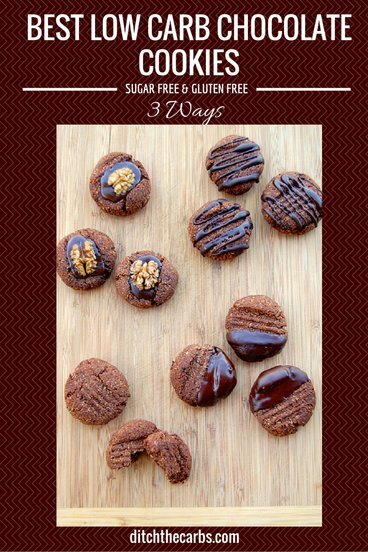 I’ve made these cookies a few times and they are always a big hit with the hubby & kids. I find I also get quite a few more biscuits from the mix, so obviously make them a bit smaller than yours. I still find 1 cookie satisfying enough, so it just means less carbs! 6.7g per cookie??? Is this net? No, all my values are total. I wish I could stipulate that but it just says “carbs”. Just deduct the fibre = net. Ok. My husband is Tyoe 2 diabetic and I am trying so hard to find what are healthy yet still yummy treats to make for him. Just made these and wow……bitter!? Followed the recipe perfectly and others as well and I’m coming up nothing but frustrated! Help me get it PLEASE!!! Did you add enough sweetener? 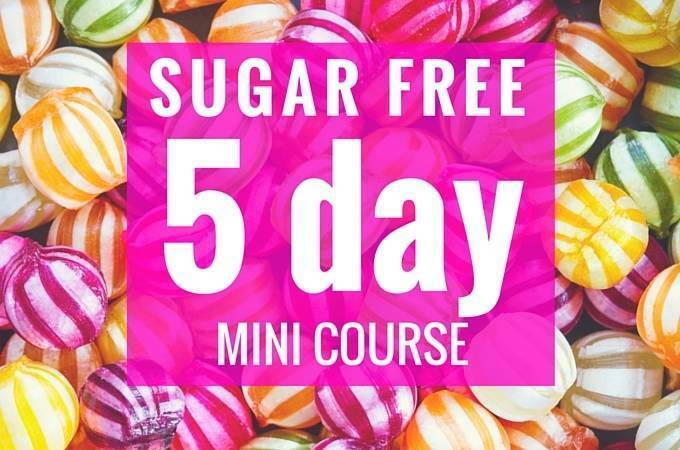 I always say add to taste as everyone is on a different part of their sugar free journey so you may require a lot more than I do. Try icing them with Lindt 90% too, that is yummy and rich. You could try my nut free peanut butter cookies. You can replace the tahini for peanut butter and add some cocoa powder. Yum. 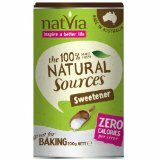 I use Natvia which is a blend of stevia and erythritol, and I also am moving ore towards plain erythritol by using Swerve. Both give good results. You can see what I keep in my pantry here. I came across your recipe, and made these for my mother-in-law for Mother’s Day and they were a big hit! I’m making them again today for me and the hubby, because our taste test cookie for her batch really impressed us. Thank you for the fantastic recipe! Loving your recipes. I have got to give props on many of these. These were great. Thank you! 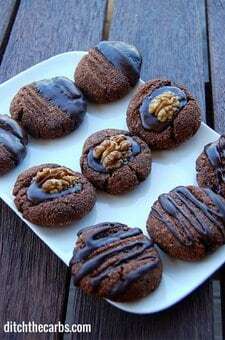 I love this cookie recipe!!! I just made a batch over the weekend and ate them all by myself in 2 days!!! Yes. Bake the cookies then when cooled, add frosting/icing and decorate any way you like. Great news that you are beginning to cook. That is awesome. Libby. Hey Libby….how do you make your icing? I’ve got a Lindt 90% cocoa bar. The icing you see is just melted Lindt 90%. Really quick and easy to do, and because it is so dark and rich, you don’t need too much. Another delicious recipe – and so quick to make!! I’ve got a 3 week old baby so these were perfect to whip up quickly while she napped and kept me away from the naughty chocolate bars! Love the richness of them – didn’t have any dark choc to hand so kept them plain, still v tasty. Thanks for the recipe Libby! Can i use coconut oil insted of butter? Sure but you may ned to add a pinch of salt and some other favouring such as vanilla? The butter tends to add a lovely creaminess whereas the coconut oil can be a bit bland sometimes. It is easy to fix by just being aware of it, taste the mixture and adapt the recipe accordingly to your taste. How about adding some chopped walnuts too? Did I miss something? I don’t see instructions for the toppings and/ or the chocolate. I like coconut palm sugar. Its all natural and its 4 grams carb per tsp. Its very sweet and I use one T for an entire muffin recipe and it’s perfect. Are the almonds measured before grinding, or after? I have almond meal, Im not grinding them myself, thanks – so LOVE your site! These look sooooo yummmmmyyyyy. Do they freeze okay so I don’t eat the whole batch in one sitting? haha! I’m sure they would, ours never hang around long enough with a family of 5. Just pop in an airtight container and have layers of baking paper in between to stop them sticking to each other. That is difficult as so many recipes call for coconut in place of wheat and grains. You can try my keto brownie. It has coconut oil but no desiccated coconut or coconut flours. If you cannot tolerate the coconut oil, you can replace it with butter instead. I made these, but swapped the almond meal for hazelnut meal (almond allergy), and the sweetener I used was 1 TBSP of a “stevia baking blend” plus 1 packet of stevia. I LOVE THESE. They came out not very sweet at all, but I strangely love them that way. They have a wonderful, meaty heft to them, a great consistency, and I’m just in love. Thank you for sharing your recipes! You can roll this into a log. Then slice into thinner biscuits, for a crispier variety. But be sure to watch they don’t burn. dependant on oven temperatures. Thanks Colleen for the tip. I like the idea of thinner biscuits. Ha ha, funny how biscuits ‘disappear’ from the kitchen 😉 Once you have gone low carb for a while, your appetite changes, this is what I have welcomed more than anything. For some lunchbox ideas take a look at my post showing 1 month of my children’s lunch boxes and for breakfast, start with something simple as scrambled eggs then maybe try the grain free granola and serve with berries and unsweetened yoghurt or cream – happy days ahead. Hi Libby, can I replace the ground almonds with coconut flour ? Almonds are so expensive now. You could try but coconut flour has totally different properties. It will thicken like flour would and won’t go crispy like almonds do. I use ground almonds as they are so much cheaper here than almond flour. Maybe look for linseed, LSA etc or even grind your own almonds if your blender is powerful enough. Would it be possible to used refined coconut oil or something in place of the shredded coconut? I really dislike the taste of coconut, so any substitution suggestion here would be greatly welcome! No the shredded coconut is dry, shredded and part of the make up of the biscuit whereas coconut oil is completely different. 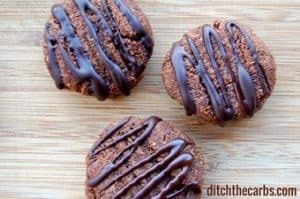 You may want to try my nut free peanut butter cookies as these chocolate cookies are heavily based on coconut so you may not like them. These look delicious Libby and something many will enjoy. Not as crunchy as a regular biscuit because it si the sugars and the gluten that make the crunchy and the chewy textures. Sounds great. Could I use almond flakes instead of the coconut? Probably not as the dessicated/shredded coconut helps keep the mixture together and almond flakes won’t have that property. I noticed that for 1 cookie that it says there’s 20.3 g of fat.